Become a Cluster Organiser for Team Challenge! Join LTL in Truro for friendly competitive tennis! Great Britain's Fed Cup team re-wrote the history books by earning a spot in the World Group for the first time since 1993. Following her impressive 4-6, 6-3, 6-2 victory over Zarina Diyas on the opening day of the World Group II Play-Off, Johanna Konta gave Great Britain a 2-1 lead by overcoming world No.38 Yulia Putintseva in another three-set thriller. The British No.1 showed phenomenal grit by battling back from a set down to level the match at one set apiece. At 4-1 down in the deciding set, she dug deep and delighted a sold-out crowd by turning the tables and capturing an epic 4-6, 6-2, 7-5 win. Despite falling in a tantalisingly close encounter on Saturday to Putintseva, British No.2 Boulter returned to the Copper Box spirited. She gave it everything on court as she too fought back from a set down, before triumphing 6-7(1), 6-4, 6-1 over world No.107 Zarina Diyas. The result edged the Brits to an incredible 3-1 victory and ended a 26-year hiatus away from the elite Fed Cup level. They will next return to action in February 2020 for the opening round of World Group clashes. Tennis is for everyone! Find out how you can get on court this summer and head to www.lta.org.uk/play. Great Britain’s Fed Cup team return to action this weekend as they bid to reach the elite World Group for the first time in over quarter of a century. The World Group II Play-Off against Kazakhstan will be staged at the Copper Box Arena in Queen Elizabeth Olympic Park, marking the first time the Fed Cup has ever been played in East London, as well as the first head-to-head between the two teams. The team tasted victory on home soil not long ago, with the University of Bath playing host to the Europe/Africa Group I competition in February. Throughout the week, Great Britain displayed world-class tennis and successfully defeated Hunagary, Greece, Slovenia and Serbia without a dropping a singles rubber. By triumphing in Bath, the team reached the World Group II Play-Offs for an impressive fifth time in eight years - and with home advatange on their side for the first time in this stage of the competition, they'll be hoping to go the distance. Led by Captain Anne Keothavong, the team have been training at the Copper Box Arena all week, to get acclimatised to the court conditions, whilst taking time out to get stuck into local activites - from an LTA Serves Festival to sliding down the Orbit! The Fed Cup by BNP Paribas is the World Cup of women’s tennis. It offers players from around the world the chance to represent their country and, with more than 100 nations involved, is the largest annual international team competition in women’s sport. The Fed Cup is structured with an eight-nation World Group and an eight-nation World Group II. The remaining countries are then divided into three regional Zones depending on their location – Americas, Asia/Oceania and Europe/Africa. Great Britain are currently in Europe/Africa Zone Group I, and are aiming to win a return to the World Group for the first time since 1993. The winning team from the play-off match between Great Britain and Kazakhstan in April will earn promotion to the World Group II for 2020. The tie will take place Saturday 20 and Sunday 21 April, with two singles matches on Saturday starting from 13:30 and up to two singles matches and a doubles match on Sunday from 12:00 - subject to dead rubber policy. Live coverage will start at 13:00 on Saturday and 11:30 on Sunday to preview the live action - catch it all on the LTA Facebook page or on BT Sport 2. Coverage will be hosted by Clare Balding with commentary from former British No.1 players Annabel Croft and Laura Robson, and David Law. Johanna Konta will kickstart Great Britain's campaign against Zarina Diyas, followed by Katie Boulter taking on Yulia Putintseva. Sunday will see the singles rubbers reversed, with Heather Watson and Harriet Dart named as the doubles team against Anna Danilina and Galina Voskoboeva. For the latest news, results and behind-the-scenes content, head to Twitter, Facebook and Instagram. Great Britain’s Fed Cup team will return to action this weekend as they bid to return to the World Group for the first time since 1993. The tie against Kazakhstan will be played at the Copper Box Arena in London’s Olympic Park – marking the first time the Fed Cup has been played in East London. 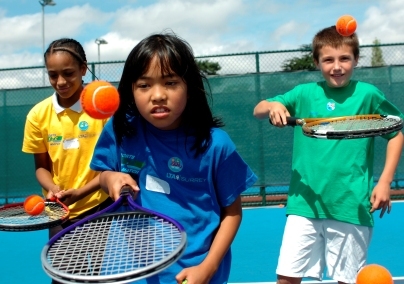 To celebrate the occasion, the LTA threw a SERVES Festival for over 150 local youngsters aged between 7 and 16. The event took place at the Lee Valley Tennis Centre, just a stone’s throw from the Copper Box Arena. Everyone got stuck into a fun day of drills, competitions and games, before taking home a medal and a special SERVES t-shirt. The festival is part of a week- long series of initiatives run by the LTA in local schools and venues across London in the build-up to the highly-anticipated Fed Cup clash this weekend (20 – 21 April). SERVES launched in 2016, aiming to transform the lives of disadvantaged people by giving them the opportunity to play tennis. SERVES courts now ‘pop-up’ at over 200 sites every week in places as diverse as mosques, church halls and youth centres. Over 10,000 young people have been engaged in the programme to date and over 600 coaches, youth workers, community and faith group leaders have been trained as tennis activators. 79% of SERVES venues and 76% of participants are in the 30% most deprived communities across the UK, with almost half of participants from BAME groups. Find out more about SERVES. Follow the GB Fed Cup team this weekend by catching the live action on the LTA Facebook page or on BT Sport 2. Great Britain's Fed Cup captain Anne Keothavong has named the squad to represent Great Britain in the Fed Cup by BNP Paribas World Group II Play-Off against Kazakhstan. Johanna Konta, Katie Boulter, Heather Watson, Harriet Dart and Katie Swan will return to action two months on from their epic triumph in Bath, which saw them win all ten of their rubbers played as part of the Europe/Africa Group I competition. The tie will take place from 20-21 April at the Copper Box Arena at Queen Elizabeth Park and victory on home soil would mean Great Britain would return to the World Group for the first time since 1993. Keothavong said: “I’m delighted to name our strongest possible team to represent Great Britain at Copper Box Arena in ten days’ time against Kazakhstan. It promises to be a memorable occasion as we aim to reach the World Group level for the first time since 1993, staged against the iconic backdrop of Queen Elizabeth Olympic Park in East London, a place that has special significance for me. A limited number of tickets to the Fed Cup World Group II Play-Off are available online. Make some noise and cheer on the team – tickets are priced from as little as £6 for children and £12 for adults. All of the action will be streamed live on the LTA Facebook page, with live coverage on BT Sport 2 - find out the full schedule and timings.